This entry was posted in Mental Health and tagged Friends and Family of Addicts, Help, Signs and Symptoms, Support on September 15, 2016 by Team Addiction Hope. 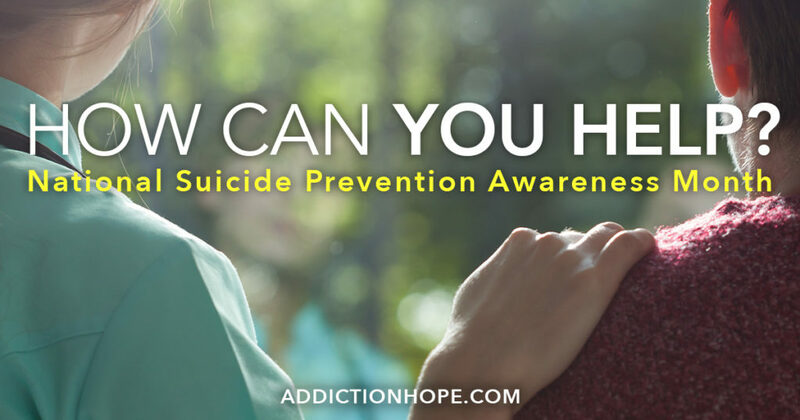 In addition to National Recovery Month, September also marks National Suicide Prevention Awareness Month, as designated by the National Alliance on Mental Illness (NAMI). Suicide claims more than 41,000 lives each year, and it’s the third-leading cause of death for teenagers. Suicide leaves thousands of family members and friends behind every year. Furthermore, a family history of suicide increases all living members’ risk of suicidal thoughts and actions. The more you know, the better you can help those you love. Suicide occurs across all demographics, although some people are more at risk than others are. According to the Centers for Disease Control and Prevention, suicide rates are increasing among people between the ages of 10 and 24. Suicide is the second-leading cause of death for this age group. People over 65 are also at risk, and gender plays a significant role as well. Women and men are equally likely to attempt suicide, but men are about 4 times more likely to die by suicide. Substance abuse is often a huge factor. More than 1 in 3 people who commit suicide are under the influence of alcohol or drugs at the time of death. Many people look to drugs for help with depression and other mental illnesses. Over time, however, the body builds a tolerance to one drug, and the suicidal person may seek harder drugs or simply more of his or her preferred drug to feel the same high. When these drugs are no longer effective, the suicide risk increases. Many suicidal people have family histories of trauma or abuse. Others suffer from chronic illnesses or disabilities. These circumstances can lead to severe isolation, because people don’t feel well enough to go out. Isolation and depression feed off each other, and people who are isolated for long periods may commit suicide because they think that no one will notice if they are gone. Stress is also major contributor to suicide. If a friend or family member endures prolonged stress, check in with him or her frequently. Ask how the person is feeling and what you can do to help. People under prolonged, severe stress often need professional counseling. Some suicidal people “joke” about killing themselves. Don’t treat such words lightly. Ask what the person means, and ask how you can help. Be particularly vigilant if offhand comments become actual threats. Many suicidal people withdraw from family and friends, gradually or suddenly. For instance, introverts naturally need more time alone than extroverts. However, if your friend or family member suddenly wants nothing to do with anyone else or rejects his or her formerly favorite activities, then there’s a problem. Also, if someone you know is mysteriously falling or getting injured more often than usual, consider it a warning sign. Some suicidal people know these warning signs and are careful to hide their thoughts and activities. Therefore, you may not know your loved one’s risk until he or she is truly in danger. Shifting moods: People may go from despair to calm or happiness because they feel that they have a plan to deal with the problem permanently. Saying goodbye: People considering suicide often say oddly timed goodbyes to their friends or family members. Putting their affairs in order: Those planning to take their own life may arrange for child and pet care, check insurance policies, put more money than usual into accounts, or give away possessions. Writing a plan or note and buying materials: Suicidal people may buy guns, bullets, rope or prescription medications out of the blue. Suicidal people need professional help. They often don’t get it because they fear the stigma. Clarify that you are a source of help and compassion, and then refer your loved one to a mental health professional. The professional may use cognitive behavior therapy, medication or other treatment methods to prevent suicide and increase mental resilience. Sign the stigmafree pledge that promises you will be a source of help to those in need, and take action regarding mental health issues in your community. This September is the perfect time to make the pledge.